It's official! We have begun 'la rentrée'.... which means back-to-school, and it is only a matter of time before I gain many more hours to do the things I love. All 3564 of them... more or less. Summer is ending, Fall is sneaking in, the air is already changing. 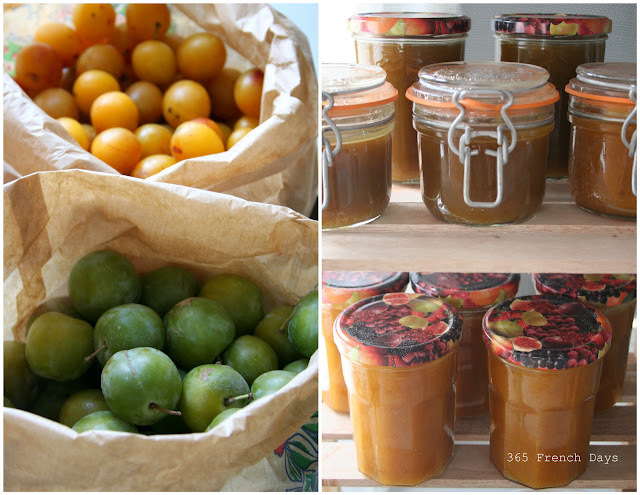 After finding an absolutely fantastic 'bio' market last week in Honfleur and buying 4 kilos of plums ('Mirabelle' and 'Blanche') I spent the afternoon making two batches of 'confiture'. I won't post a recipe. There are 100's, make that 1000's of jam and jelly recipes on the web and I go by instinct; 2 kilos of fruit, 3 cups of sugar and keeping the pits and skins on during the boiling period for the natural pectin. 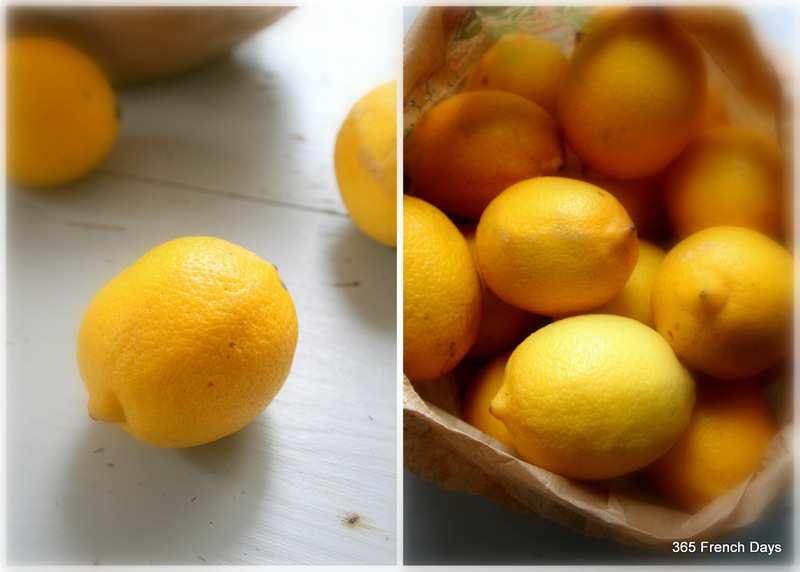 To the 'Mrabelle' batch I also added orange zest and a touch of cinnamon. The 'prune blanche' were actually very green! Such a gorgeous color before cooking. Nothing extra added to that batch--they are wonderfully sweet and a tiny bit tart! Tomorrow I head out to that same market in search of figs! I hope I am not too late! Looking forward to the new cooking season--the change of climate--and many, many more uninterupted hours in the kitchen and/or behind the camera! Oh well! A girl can dream! A bientot! For I don't know how long ... 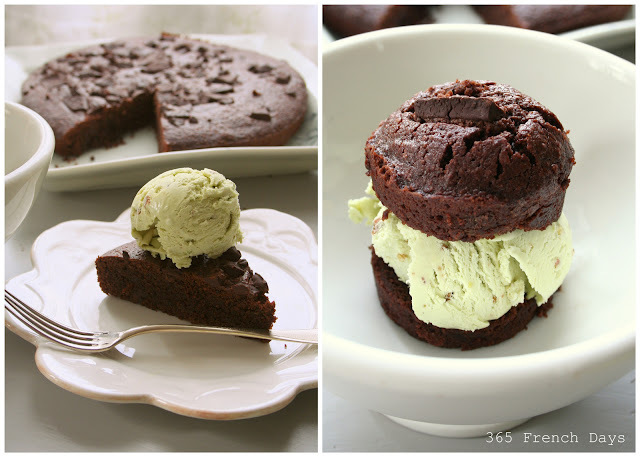 I have had this crazy persistent craving for warm melt-y decadent chocolate brownies with pistachio ice cream! I finally gave into it last night and made big batch of really indulgent goodness! I convinced myself that I did this for two reasons--one, it was the first day of September and nothing feels more like the official ending of summer than September arriving! --and second, 'les garcons' are returning to school next week and I thought they deserved a little comfort food on their last official weekend of summer 'vacances'. Truthfully, yes. We all know that it was more about me and what I wanted... and I had to have these! They turned out amazing and I have to tell you that nothing fills a kitchen in a better way on a cool first-of-September Saturday evening than the smell on melting chocolate! A few things make these brownies a little more 'to-die-for'.... I used almond flour which give a wonderful gooey and rich texture, I add orange-dark-chocolate chunks and for moisture and even more richness, I use creamy coco-nut milk. So yes, these are both wheat/gluten free and dairy free. 1 cup ( or 1 large bar broken into pieces) chopped dark chocolate, I used dark chocolate with orange! I find with brownies, they are made to be unfussy. 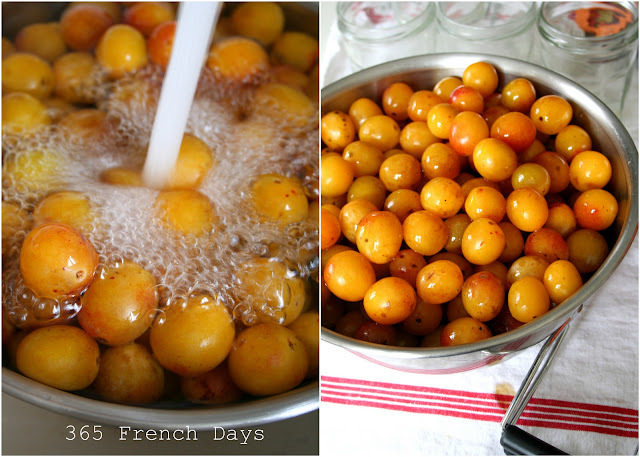 I literally do every thing in one bowl, blending with an electric hand mixer as I go along. I added most of the chopped chocolate chunks to the batter and then sprinkled the rest to melt on top and I used both a round cake form and a few small cup-cake cups made of silicon to cook the brownies. Bake at 350 F degrees or around 180 C degrees for just under 30 minutes or until they are firm but still slightly gooey! These days I am a big fan of pistachio ice-cream...but French Guy is allergic to pistachios so he had his brownie with creme-caramel. Delish! Satisfied the craving perfectly! Try it and see! My mother-in-law brought two 'barquettes' of tiny wild strawberries to me when they came to lunch last Sunday. Tiny and sweet they had to be eaten instantly--- or dried to use later. Almost any fruit can be dried one way or another--but strawberries, especially little ones, once dehydrated make lovely little raisin-like gems that can be saved for cooking in cakes or even cookies! 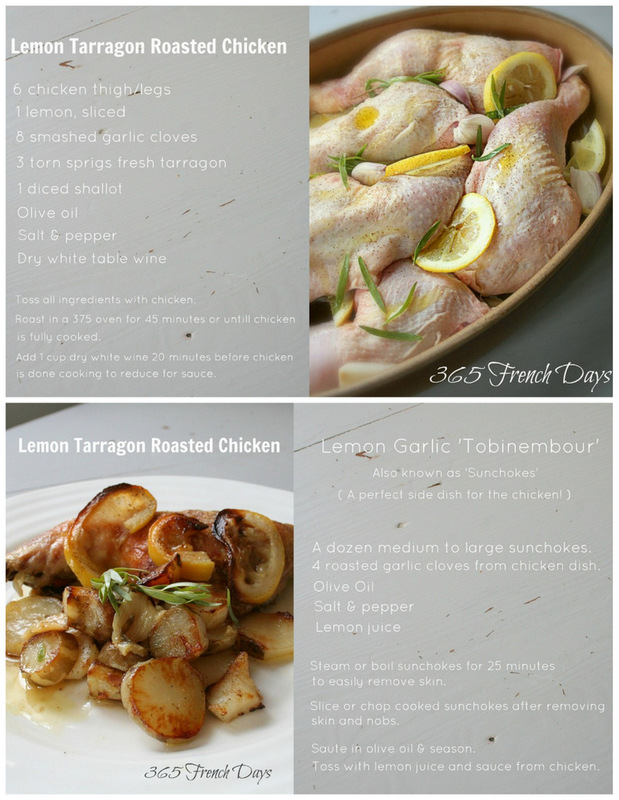 If you have a dehydrating machine than you probably have made these already--but they are just as easy to make in your oven. 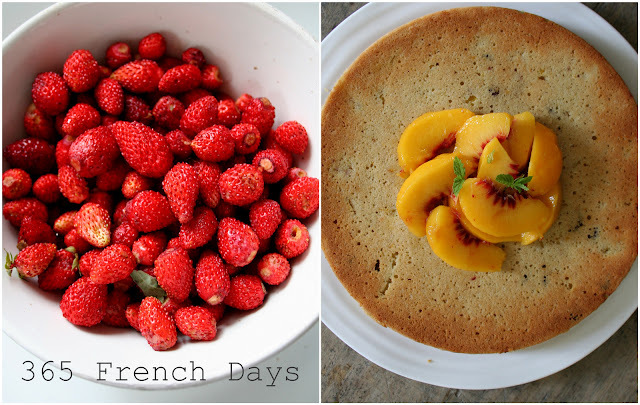 Simply wash and dry the berries, slice them if you are using large or normal strawberries, the little wild ones don't need to be cut up, and once they are dry lay them on parchment paper in a very low temp. oven, even the warm setting works, for 4- 6 hours. 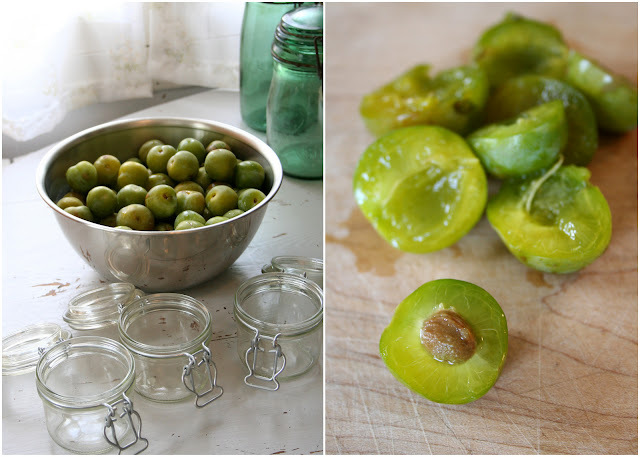 (You can store them in an airtight jar -- just be sure they are totally dry, otherwise they can still mold.) I kept mine in the fridge because I knew I would use them right away! 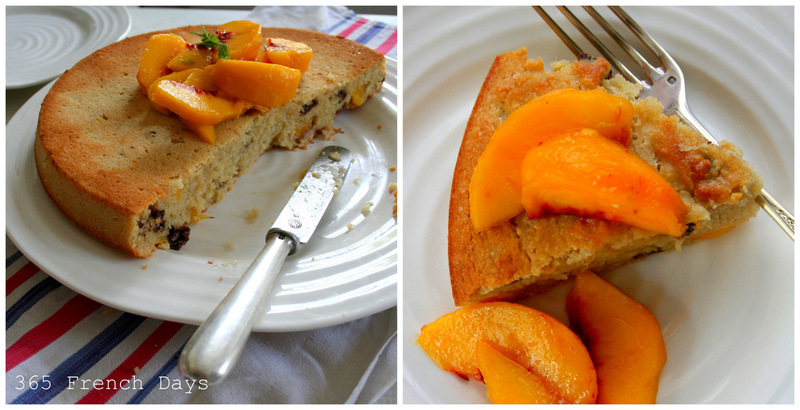 The cake I made with them was a gluten and dairy free fresh peach cake. The result is a sweet and tender cake studded with the tiny strawberry raisins! Blend the dry ingredients and set aside. Combine the wet ingredients and add to dry. Mix until well blended and pour into a silicon cake form. 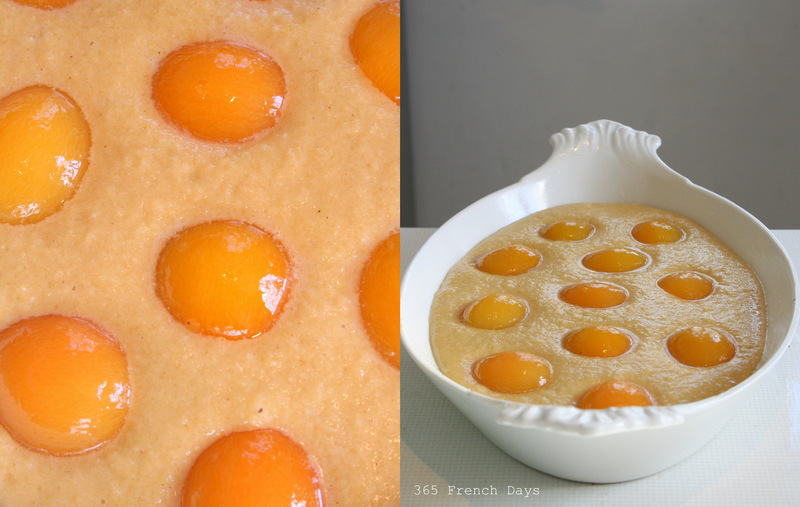 Bake at 350F degrees for 50 minutes or until the center feels solid and the top is golden. Cool before slicing. Fabulous as a breakfast cake --- or topped with vanilla ice cream as desert! Enjoy! 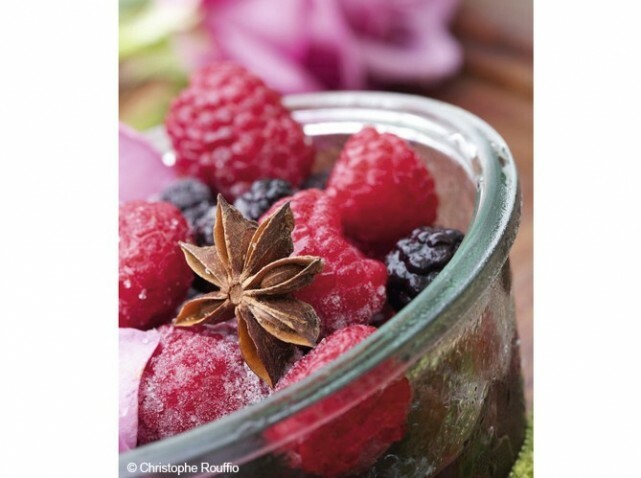 My niece recently pointed out this gorgeous and very inspirational image from a French magazine, Campagne Décoration -- it is the quintessential French 'pique-nique' don't you think? It makes me want to dream up a delicious fresh summer menu--and pack it into a basket -- to tote off to a table under a tree -- or the beach! And even my vintage purchases for Sunday Brocantes of late seem to all be influenced by food! ... into antique French confiture jars! The thick-sided jars, chilled in the fridge, so everything stays fresh and cool! 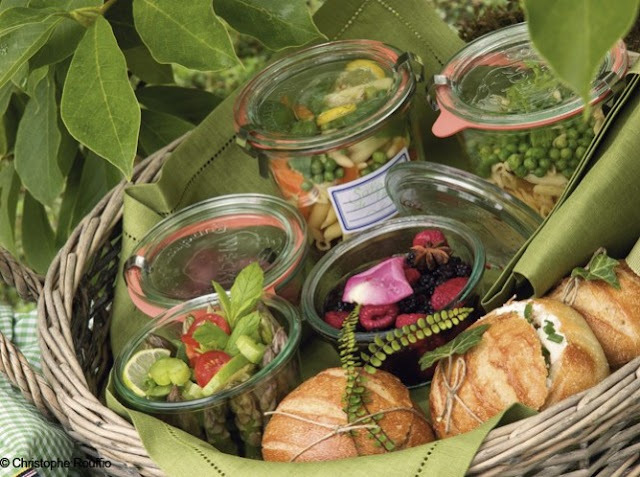 As the summer winds-down, I hope you can still sneak in some time for one last French-picnic ... or two! I know I will! While you might expect summer salads to be comprised of garden fresh plump, ready to burst red tomatoes or bright orange hot peppers and roasted corn--our summer here in Normandy has been a complete mix of sun and showers, a few warm rays, but mostly windy, chilly and half-way summery. Here is a salad that marries the warm with the cold--and fits our summer perfectly! Maybe yours too! Clean the chard and remove the ribs, chop and prepare to saute first in 2 tbs olive oil while you set the leaves aside. Add 1/4 chopped red onion and once tender, add the remaining leaves of chard until wilted. In a large 'saladier' mix cubbed beets with zuchinni, 4 tbs red wine vinegar and salt and pepper. Add chopped herbs and combine with warm chard mixture. Lastly top with crumbled goat cheese. A baguette 'tartine' with cheese and fresh basil makes a perfect summer lunch--on a warm or chilly summer day! This past weekend was an eating extravaganza! 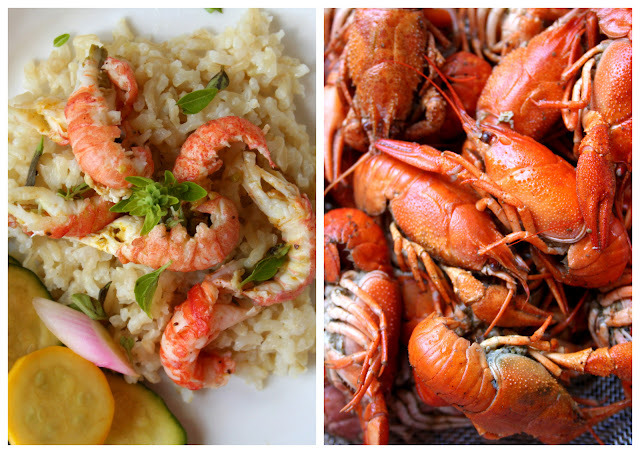 A foodie-weekend ... a food-a-palooza! What else is there to do when it is pouring rain for the 65th consecutive day--windy, dismal .... not summer. Sunday was all about seafood---the big plan being that we would sit outside and fire-up the 'plancha' and grill our lunch. Yet again, no. Rain. (Are you getting the theme here?) But, we managed to cook a few delicious 'ecrevisses'...the fancy French way to say Crayfish--and once again French Guy stepped up and this time braved the rain to quickly cook up sardines--which were spicy and crispy--all of this topped simply on brown rice with tangy pickled zucchini and yellow squash. ... but before that, in honor of my Japan-o-phile Oldest Garcon (temporarily? obsessed with all things Japanese--he even convinced French Guy to take him to the Japan-Expo is Paris last week!) and also because Middle Garcon could eat anyone---(including the biggest sumo-wrestler) under the table with the amount of sushi he can consume .... there you have it--- homemade sushi for dinner that we ate standing in the kitchen as it was made..... très casual! So here it is Monday morning -- and culinarily--I think I can speak for everyone in the family to say that our tummy's are satisfied! (and so is my styling eye and my shooting finger!) Afterall-- a well rounded weekend includes family, food, and ... photography! And this morning .... a more simple start. Gluten-free toast with 'buche blanche de chevre' and a big dab of strawberry jam--made by Bonne Maman---not moi. Happy Monday mes amis! Hope your weekend was full of food---and SUN. But truth be told, even though it is a root vegetable and available year-round, in a cold soup it shines with vivid flavor and talk about amazing color! It's natural pairing with another root vegetable, ginger brings a snappy almost citrus flavor to the soup and topped with fresh herbs and plain yogurt, it has a snappy and fresh taste! In a saucepan, saute shallots in 1 tbs olive oil. Add grated carrots and sweat for 5 minutes. Add carrot juice and grated ginger, salt to taste and continue to cook for about 30 minutes on medium heat. (Do not let the soup boil, you want to completely cook the carrots until they are tender, but you do not want a cooked or over-cooked carrot taste.) Allow soup to come to room temperature and use an immersion blender to puree the soup until completely smooth. Blend in creme fraiche and refrigerate the soup until chilled. Garnish with plain yogurt and herbs. Serving ideas: If not eaten as a soup-course, the soup is a great appetizer 'shooter' in a small glass, or served in recessed cucumber cups. It may be the only kind of sunshine I see for a while longer! But I hope not! Come on summer! We are waiting for you! Confession time. I have been known to replace meals with peanut-butter and jelly sandwiches. You know those evenings when the kids and you have already had a 'real' meal and you just can't imagine cooking up another one....or one of the children is particularly picky about what's for dinner so you say "Fine. You can have a PBJ sandwich!" It must have happened to me as a child--why else would PB&J inspire such memories of comfort and goodness? Nutritionally, it's not such a bad option, right? Whole grain organic bread, protein from the PB and vitamin C from the strawberries in the jam? I'm convinced. So last Sunday when we all woke early, thanks to the youngest member of the family-- (a-hem....Monkey) I decided to make muffins for breakfast for all of us, but wanted something a little different--and the littlest early riser was already making her way through her toast with PB so the jar was out.... et voilà -- Inspiration! Peanut-butter is not altogether common here in France. We found one store that carries a brand from the UK--and I think we just might be the one single-family keeping them in business for French sales! Thoroughly mix the dry ingredients. In a separate smaller bowl blend peanut-butter and eggs until frothy for about 1 minute. Then add this to the dry ingredients and blend on low-speed for another minute while slowly adding apple juice. Fill muffin tray and bake at 350 degrees for about 15 minutes or until brown and 'cracked' on top. After they have cooled, split the muffins in half and spread with jelly or jam. Top with jam and fresh strawberries. A cup of coffee and a few strips of bacon and you have a proper breakfast! These are even better the next day.... or evening. For dinner. I can't say enough good things about Rhubarb. When it comes into season, I know I must be smiling when I see the gorgeous pink and green stalks at the market. Obviously associated with spring--it also seems to herald the arrival of summer plantings that are soon to come in the 'potager'... if the Rhubarb is here--then it is all getting better from now on. And from my 'petit potager' ... two strawberries this week.... two. Slightly prematurely picked by the 'petite jardiniere' but a few days on the windowsill and they were ready to eat--and as precious as they were, each split in half to make four servings....none for Petite Fille yet, but for the two garcons and the French Guy. Rhubarb also reminds me of my Grandma--as many kitchen creations do. She made a fierce Rhubarb pie.... and then after that Rhubarb reminds me of a post-college trip to Scotland with my best friend and staying in a 'hostel' where we had Rhubarb compote on our oatmeal every morning..... I think that is what hooked me on the smell. That luscious aroma that comes from the rising steam of the bubbling Rhubarb --- heaven. I am sure that I will be making compote, a cake or a tarte.... but to start with... Chutney. 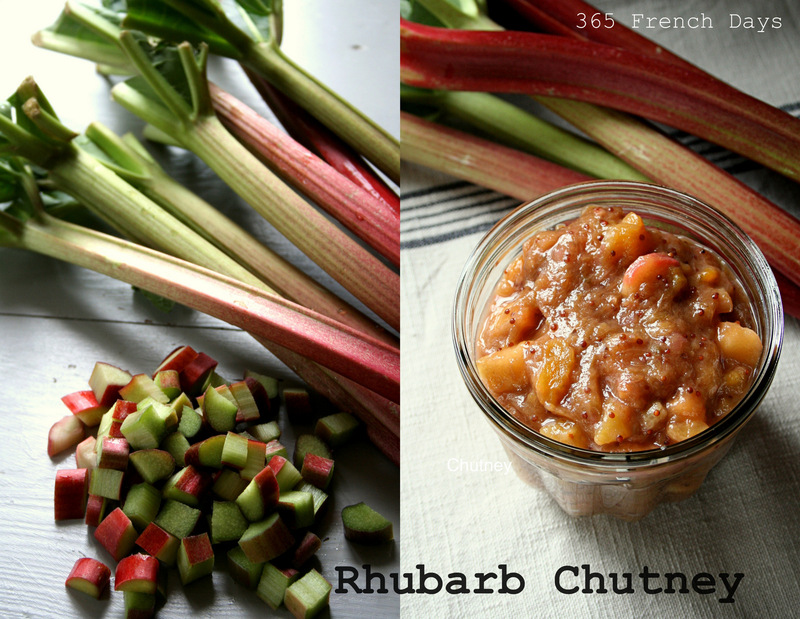 I had never made chutney with Rhubarb before... and after tasting this batch, I surely will again! In a small amount of oil, lightly saute the shallot until tender. 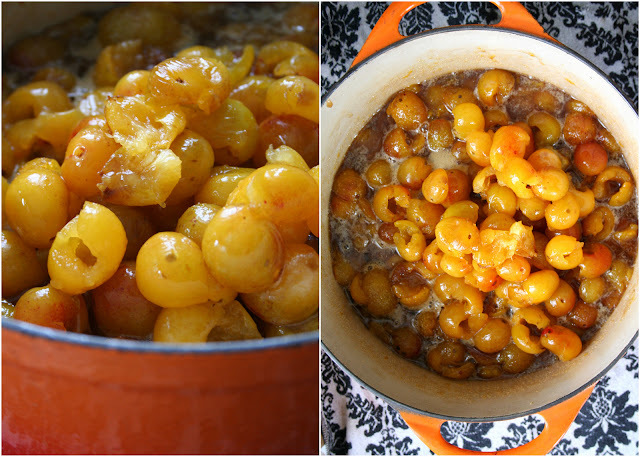 Add the remaining ingredients and cook down until the mixture reaches a compote-like consistency. I save a bit of the zest to add at the end for a little extra zing. We had the chutney that evening with duck-confit and later in the week with pork chops.... it is most definitely a fabulous alternative to traditional chutney! 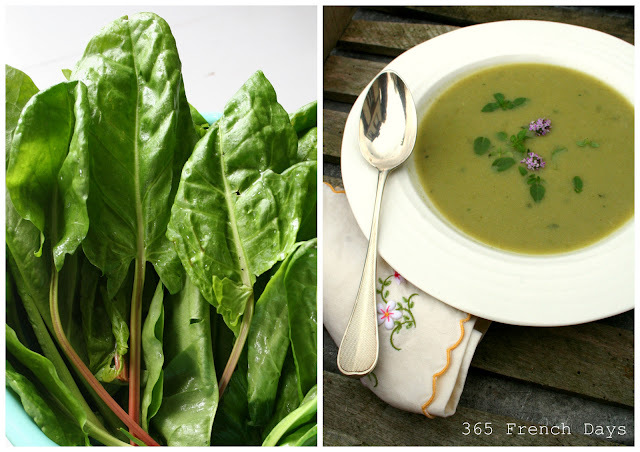 Last spring, my father-in-law gave me a few sacks of washed greens .... looking a bit like spinach. The greens were actually 'oseille' or in English, sorrel. The only recipe I came up with last year to use the plentiful bright green tender leaves was to make a creamed-sorrel side dish for a pork roast and although it was good -- it didn't win me over to seek out these vitamin laden, slightly bitter greens again. Until now. Our spring here in Normandy has been intermittently chilly, rainy and absolutely unpredictable with sudden bursts of gorgeous sunshine that lasts for mere minutes on a bad day and about and hour or two on a good one! So yes, soup is still very much on the menu. But my cravings for hearty thick, stewy-soups, have given way to a desire for garden-fresh and very green vividly flavored ones. Because oseille, has a tart and snappy bite, it is parfait! 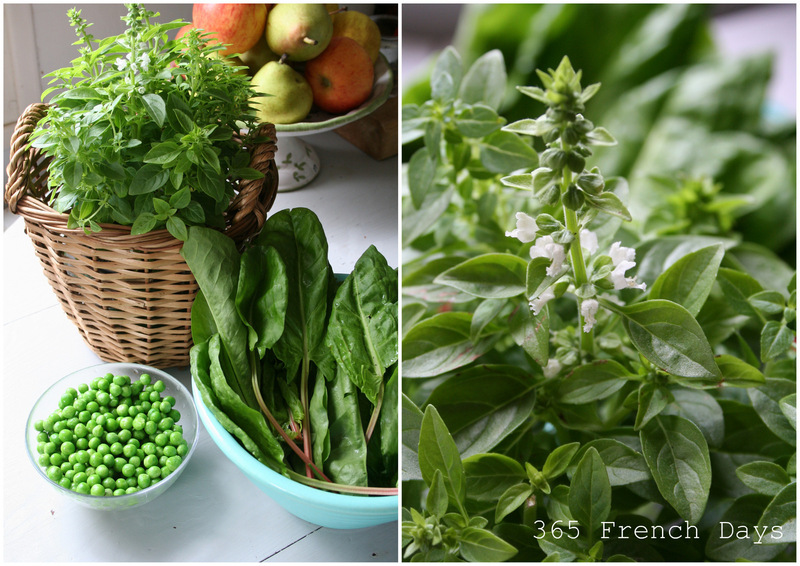 I also have a gorgeous organic basil plant that is sitting on my kitchen table and is pinched several times a day. Eventually, (read 'could not be soon enough!') I will be pinching these things from the 'potager' that is bravely sprouting up in the raised beds we put in a few months ago. Sweat the leeks and garlic in 3 tbs. of olive oil until tender. Add salt and cubed potatoes and cover with stock. Cook until potatoes are tender, reduce heat and add peas and about a minute later add sorrel. Process with a stick blender until smooth, and basil and process until basil is fully combined. Serve warm. It's a perfect fresh-green and comforting for those chilly spring days--or moments.....soup! Happy chilly, rainy, sunny, windy, hail-y, sunny, warm, chilly.....rainy..... SPRING! Phew! Did I mention that French school children have FORTY vacation days per school year?! The French value their 'vacances'.... and today, well... so did I! Even with all of the 'extra' days -- today felt like a holiday. Maybe it was the sun shining and the almost 70 degree temps... we did very little work, aside from gardening (and that is pure j-o-y!) and we BBQ'd sausages and I made potato salad. Potato salad? I know. Not very French. But still-- it really helped us feel spring, holiday, BBQ picnic..... fabulous--vacation-day-OFF! I made a very easy--yummy (and of course gluten free!) version... a la Francais! 1tbs dried chives, parsley or any herb blend you have handy. Combine all and chill for at least 30 minutes before serving. Serve with chopped fresh herbs. We had this for lunch today and then spent the rest of the day outside, pulling weeds, planting seeds, taking a walk on the beach .... a perfect plan for a bonus--day off! Tonight I will fall into bed deliciously-exhausted! A bientot! See you again soon! This is our second Easter in France and my second Easter cooking for family as well. Last Easter Petite-Fille was less than 3 months old.... and it was a lunch for us four (moi, les garcons, French Guy) plus French Guy's parents and his sister; a simple affair -- ham, gratin-pomme de terre..... macarons from a local patisserie. So I thought we should have everyone here for lunch again, especially since this Easter my parents are here for the Spring Break vacation. So that's how it began. ... well I think you get the idea. Easter lunch for six plus three became lunch for SEVENTEEN.... plus. So naturally the menu grew as well. Five courses; starting with Spring pea salad and smoked salmon, followed by lamb, pork roast, puree de pomme de terre with herbs, flagolet, a cheese platter and salad, almond coconut cakes, strawberries and mousse au chocolat, and coffee....... and of course a large quantity of Easter candy before, during and after. crispy and chop into small bits. In a salad bowl, combine 1/2 cup mayo with 1 tbs. fresh dill and 2 tbs. chives and about 1/3 cup finely diced red onion. Add a dash (about 2 tsp. maximum) red wine vinegar and whisk until blended. Toss peas in dressing and refrigerate for about 30 minutes. I served the pea salad in endive leaves. 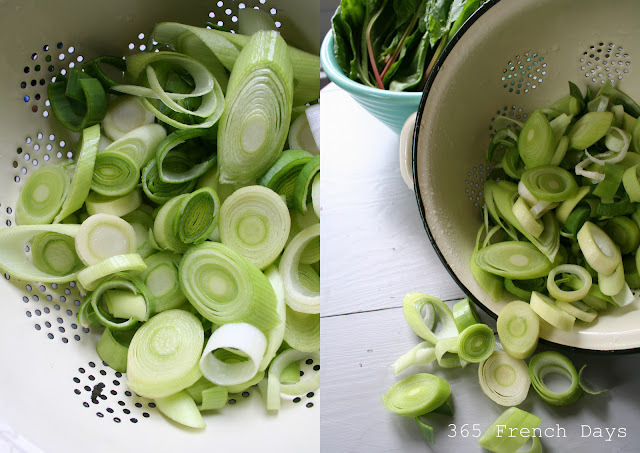 You can also fill small lettuce cups or even just toss with mixed greens. It's a super-easy salad that has fresh green spring flavor! Hope you had a lovely one, too!